Dusty and rutted in dry spells, muddy and miserable in wet, Delavan’s main street, Walworth Avenue, remained unpaved from the 1830’s until the second decade of the 20th century. 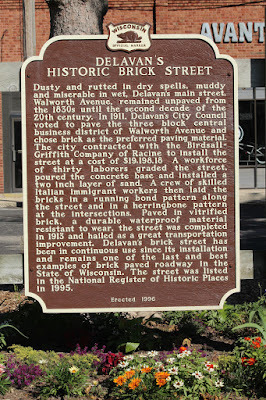 In 1911, Delavan’s City Council voted to pave the three block central business district of Walworth Avenue and chose brick as the preferred paving material. The city contracted with the Birdsall-Griffith Company of Racine to install the street at a cost of $19,198.18. A workforce of thirty laborers graded the street, poured the concrete base and installed a two inch layer of sand. A crew of skilled Italian immigrant workers then laid the bricks in a running bond pattern along the street and in a herringbone pattern at the intersections. Paved in vitrified brick, a durable waterproof material resistant to wear, the street was completed in 1913 and hailed as a great transportation improvement. 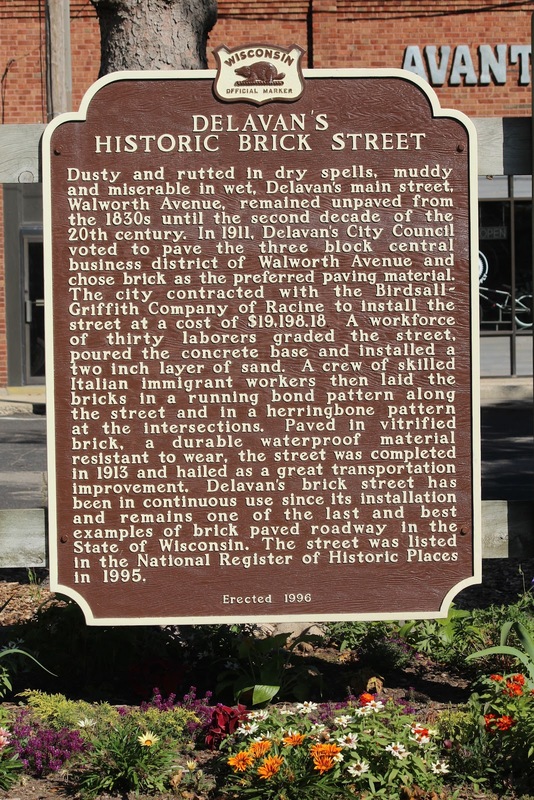 Delavan’s brick street has been in continuous use since its installation and remains one of the last and best examples of brick paved roadway in the State of Wisconsin. The street was listed in the National Register of Historic Places in 1995. The marker is located in Tower Park (you can't miss the water tower), on westbound East Walworth Avenue, just east of its intersection with Main Street, Delavan, Wisconsin 53115. The marker is visible to the left of the flag. The marker is to the right of this water tower. The brick street . . .
Where the brick street ends, at the Delavan Post Office (to the left).